Sixty players from 60 countries and regions. Eight rounds over four days. For 31 years, the World Amateur Go Championships (WAGC) have assembled a global gathering of top amateurs to compete, meet and spread the game of go around the world. This year’s WAGC is being held this week in Hangzou, China, organized by the China Qiyuan, the Chinese agency responsible for board and card games, under the supervision of the International Go Federation, and co-organized by the Hangzhou Branch of the China Qi-Yuan (Chinese Go Association). After arriving on Monday and participating in the IGF General Meeting and opening ceremonies on Tuesday, the tournament proper commences on Wednesday morning. This year, DPR Korea, playing in the WAGC for the first time since 2006, joins China and the Republic of Korea as top contenders for the title. China’s Chen Wang is just 17 years old but won the Chinese Evening News Cup. Taewon Jo of DPR Korea, a veteran at age 21, won the individual amateur event in the World Mind Sports Games in 2008. And Hongsuk Song, a year older at 22, has been doing well in the Republic of Korea, winning the international Korean Prime Minister’s Cup last October and more recently taking the amateur Kuksoo title and the Korean Sports Cup. Two more 17-year-olds who bear watching are Nai San Chan of Hong Kong, China, and Thomas Debarre of France, who finished third and eighth, respectively, in the World Amateur Go Championship last year. Also hoping to place in the top eight are newcomers Cheng-hsun Chen (age 11, at left) of Chinese Taipei and Yohei Sato (29) of Japan, but they will be vying with a group of twenty other players ranked 5 dan and above, including established stars such as Ondrej Silt (23) of Czechia. The American Go E-Journal will team up again with Ranka this year to provide complete coverage of the World Amateur Go Championships (WAGC). The 31st annual competition among top amateur players from around the world is set for May 24-31 in Hangzhou, China. American-born pro Michael Redmond 9P will provide game commentaries for the Ranka/E-Journal effort – which will include ongoing updates on both Ranka and the AGA website , as well as via daily E-Journal reports — while Ivan Vigano, James Davies and Chris Garlock will report and John Pinkerton will provide photos. NOTE: if you have tips about go places to visit in Shanghai — or have go contacts there — please email journal@usgo.org immediately. Click here to see last year’s coverage, and here for this year’s WAGC details, including the schedule. 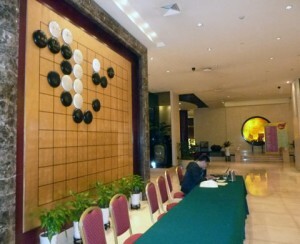 photo: Hall of Hangzhou Tian Yuan Tower, where the WAGC will take place. RAMON RULES BELGIUM: With ruling champion Lukas Neirlinck absent from the Belgian championship, François Gonze looked to be the heir apparent, comfortably leading the round-robin field 7-0. But a hungry Jan Ramon defeated Gonze in Round 8 and claimed the crown last Sunday. HWANG, SKIPPING AND DROPPING, WINS BERLIN ANYWAY: Despite skipping the Sunday morning round and a last-round loss to young Lukas Podpera 3d, defending champion Hwang In-seong 7d won the 11th Go to Innovation tourney in Berlin March 19-21. Zou Jin 6d of Leipzig was second with 1682 (4-4) and Lluis Oh 6d of Barcelona third 1633 (5-3), local Bernd Schütze 5d finished fourth with 1567 (5-3). Young strong emerging Czech stars included Petr Kouba 7k and Ondrej Jurasek 9k, who both won 7-1, while Martin Divis 14k had 6-2. Click here for the full results of 61 participants. THREE TOP CHARLEMAGNE BUT ONLY ONE GETS UKIYO-E: Willem-Koen Pomstra (r), Rudi Verhagen (both 5d) and Michiel Eijkhout 6d took the top of the table in the 37th Charlemagne (‘Keizer Karel’) tournament in Nijmegen last weekend. Last year, Eijkhout had won the challenge cup for good. The new challenge trophy is an ukiyo-e from Hakusai “The Fisherman and the Sea”. Pomstra won it for one year by a single sosos point. The first to win it three times in a row — or five times in total — can keep the trophy. Zeno van Ditzhuyzen 1k made clear he should be at least shodan with wins over both a 2-dan and Bernd Radmacher 5d. Also with 4 wins: Koen Rosendaal 2k, Yvonne Roelofs 4k and 7k’s Jeroen Landolt and Rob Friederichs. No-one of 46 won all five rounds. Click here for full results. WEEKEND WINNERS: In Cyprus capital Nicosia, Cyprus Champ Dimitris Regginos 1d stayed two points clear of the rest of the 10-player field over the 6-round Friendship tourney last Saturday. In Moscow on the same day, the under-18 team tourney fielded six teams of four, with the team from 50Kr victorious. In Braila 17 took part in a preliminary for the Romanian Cup on Sunday, with top-ranked favorite Adrian Becheanu 10k scoring a clear 5-0 clean sweep. MARCH MADNESS UPSETS ABOUND IN KGS LEAGUE: KGS Insei A-League leader Danigabi dropped back to fourth place after losing unexpectedly to Arlequ1 from France. Fredda added another win and now leads the A-League 9-1. In division B fedor didn’t play last week and still leads 4-0, while Elvina Karlsberg is next with 10-1. More drama has erupted in C-division, where Texmurphy is in the lead after Canadian DRhazar lost one (2-1). US grumbles leads division D 2-0, ahead of Russians Lodurr (7-1) and DarkArhont (4-1), and imagine (5-2) from Turkey. Tarutius (Russia) 5-0 is on top of E with smalltree (US) 1-0. ZHU CLEANT ERLANGER: Zhu Wei 3d engineered a 5-0 sweep in Erlangen at the 24th Erlanger (Germany), March 13-14, ahead of Marlon Welter of Göttingen and Thomas Kettenring from Munich (both 4-1 and also 3d). Zhu is member of Roter Stern Nürnberg (Red Star Neurenburg) team in Bundesliga top-division. Click here for full results of 49 participants. LEE CHANGHO TAKES 2-1 LEAD IN KUKSU: Lee Changho 9P defeated Hong Kipyo 4P by resignation Friday in Round 3 of the 53th Kuksu title match to take a 2-1 lead in the best-of-five match; Hong had tied the match at 1-1 last Wednesday. Round 4 will be played on March 23rd. CHINA’S SONG/XIE WIN PAIR GO WORLD CUP: China’s Song Ronghui 5P and Xie He 7P defeated Korea’s Lee Minjin 5P and Mok Jinseok 9P by resignation in the final game of the 2010 Pair Go World Cup on March 22, winning the title. BC CARD CUP SEMIS TO FEATURE PARK JUNGHWAN- CHANG HAO & LEE SEDOL- KIM KIYOUNG: Park Junghwan 7P defeated Niu Yutian 7P by 3.5 points on Sunday to advance to the BC Card Cup semifinals, where he’ll face Chang Hao 9P, the only player left standing for China. Chang Hao defeated Choi Cheolhan 9P on Saturday to secure his berth in the semis. On Friday, Lee Sedol 9P defeated Park Yeonghun 9P by 4.5 points in the quarterfinal match of the 2nd BC Card Cup, advancing to the semifinal to play Kim Kiyoung 5P, who defeated An Choyeong 9P by 1.5 points in their quarterfinal. CHINESE TOURNAMENT ROUNDUP: Wang Xi 9P defeated Piao Wenyao 5P in the final game of the 9th South-West Qiwang, winning the title. 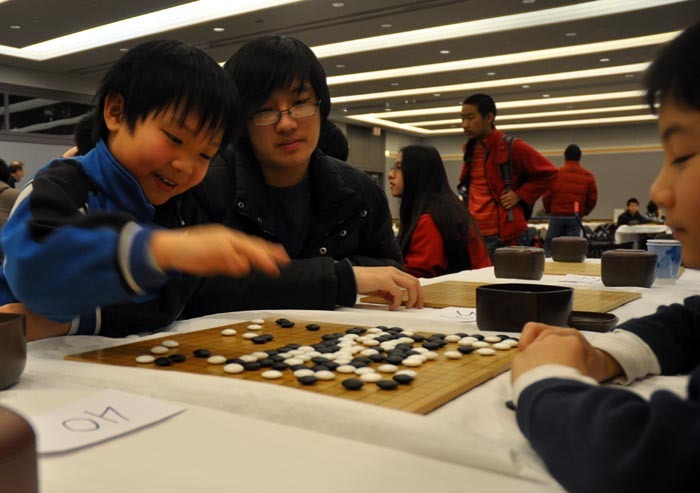 Gu Li (Mingren) defeated Shi Yue 4P by 3.5 points in the preliminary final of the 24th Tianyuan (Tengen). Gu Li will now face Chen Yaoye (Tianyuan) in the title match; Chen Yaoye took the title away from Gu Li in last year’s Tianyuan. Li He 2P defeated Wang Chenxing 2P by resignation in both the second and third rounds of the 4th Female Xinren Wang (Shinjin O), winning the title 2-1. Wang Chenxing 2P had defeated Li He 2P by 1.5 points in the first round, while Fan Tingyu 2P defeated Yan Huan 3P by resignation in the first round. Click here for game records for many of these matches. YUKI RETAINS NHK TITLE: Yuki Satoshi defeated Iyama Yuta by 3.5 points in the final of the 57th NHK Cup on February 22 to retain his title. Click here for the game record. LEE CHANGHO OVERCOMES ODDS TO CLINCH NONGSHIM CUP: Lee Changho 9P, the last player on the Korean team, overcame a rough flight and three top opponents to win the Nongshim Cup title on March 12. “Lee Changho’s condition is not good” said one ominous news report early last week after Lee – who does not like air travel — arrived in Shanghai for the third and final stage of the 11th Nongshim Cup suffering from migraine headaches after his flight had experienced severe turbulence. China’s Liu Xing 7P eliminated Japan in the first round on Tuesday, defeating Hane Naoki 9P, but then lost by resignation to Lee on Wednesday. That still left China with a 2-1 advantage, however, with Chang Hao 9P and Gu Li 9P between Lee and the title. In an exciting game, with ko fights all over the board, Lee defeated Gu Li by resignation in the third round on Thursday and clinched the title on Friday with his win over Chang Hao by resignation in the final round of the Nongshim Cup. XIE YIMIN RETAINS TITLE AS FEMALE MEIJIN: Xie Yimin defeated Mukai Chiaki 4P last Wednesday to retain her Female Meijin title. Xie won the second round by 2.5 points to sweep the 22nd Female Meijin 2-0. With all three of Japan’s female professional titles – Meijin, Kisei, Honinbo – and the Daiwa Ladies Cup firmly in her possession, Xie is clearly the top female professional in Japan. LIAN XIAO WINS RICOH CUP: Lian Xiao 3P defeated Li Haojie 3P by resignation in the final game of the 4th Ricoh Cup (Xinxiu) last Wednesday. 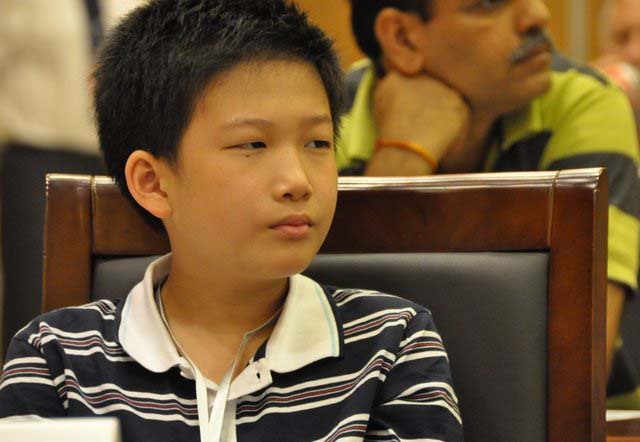 Lian Xiao is a 15-year-old Chinese professional player who was promoted to 1 dan in 2007 and 3 dan in 2009. Xinxiu means “new talent” and this Chinese tournament for youth players is currently sponsored by Ricoh. From 1998 through 2001, a tournament under the same name was sponsored by NEC. Prizes are 30,000 Yuan [ca. 4,400 USD] for the winner and 10,000 for the runner-up. CHOI WINS FIRST ROUND IN MAXIM: Defending champion Choi Cheolhan 9P defeated Kang Dongyun 9P by resignation on March 15 in the first round of the 11th Maxim Cup. This is Kang Dongyun’s first Maxim Cup title match. The Maxim is a 9P-only Korean tournament sponsored by Dong Suh Foods. The second round will be played on April 5th. RUI 1-0 IN FEMALE KUKSU: Rui Naiwei 9P defeated Cho Hyeyeon 8P by resignation in the first round of the 15th Female Kuksu (National Champion) on March 15. Rui has played in the Kuksu finals eight times, including this year’s match. Her only Kuksu title loss was to Cho Hyeyeon in 2003 at the 9th Kuksu. The second game will be played on March 24th. U.S. GO NEWS: Qu Sweeps Norcal Tourney; World Youth Qualifier Moved Up To April 3; Northeast Interclub Tourney Invites Teams; School Team Tourney Setting New Records; Agf Accepting Apps For College Scholarships; Aga Ratings Updated; New AGA Database Feature Links Players; Why Host A Pro Workshop? WORLD YOUTH QUALIFIER MOVED UP TO APRIL 3: The selection process for the World Youth Go Championships has just been dramatically accelerated, with an online qualifier to be held April 3 and the finals held on April 10-11. “The Ing Foundation has just notified the AGA that our representatives to the World Youth Go Championships must be selected by April 15th, a sudden change from last year’s policy,” reports AGA Youth Coordinator Paul Barchilon. Since this is before the previously-scheduled USYGC Qualifiers will have chosen winners, a new schedule has been established. Youth players who wish to enter must e-mail youth@usgo.org to register by March 30th. The top sixteen players in each bracket will advance to the finals. The Junior Division is for youth 11 and under, the Senior Division is for youth under 18 as of August 1, 2010. Only US Citizens may enter the qualifier; the winners must be able to travel to Taiwan for the finals (expenses are covered for the youth players, but not for parents). “The previously-scheduled USYGC Qualifiers around the nation will all be held as planned, and the prizes will remain the same, but as those events will no longer select our WYGC representatives, the citizenship requirement will be waived,” says Barchilon. SCHOOL TEAM TOURNEY: A record breaking 92 teams and 307 individuals are competing in the ninth annual American Go Honor Society (AGHS) School Team Tournament, representing 15 states and 3 provinces in Canada. Two schools, Fair Oaks ES (CA) and Saratoga HS (CA), are entering five teams each, matching Clear Lake HS (TX)’s record, back in 2004. Stuyvesant HS (NY) will seek their second consecutive and third national title in the Open Division. However, they will have to overcome JP Stevens HS (NJ), last year’s silver medalists, along with seven California teams, including all three teams from CA’s 2008 medal sweep, who will seek a spot on the podium after being shut out last year. East Meadows HS (NY) fell just short in their bid to become the second team in AGHS history to win both the Rookies Cup and the School Sweepstakes title, awarded to the best new school and best overall school in the tournament, finishing in second place in the final standings. However, two California schools, Morningstar Chinese School and Redwood Shores GC, hope to accomplish this feat after stunning performances in the first round. In addition, fourteen elementary and middle schools will fight for the Junior Cup title this year, including reigning Junior Champions Cary Chinese School (NC). who are expected to put up a stiff fight to retain their title. Yet they were barely able to hold off a surge from Fairs Oaks ES (CA), who will seek to add the Junior title to their long list of achievements under AGHS competitions. Readers can keep track of the teams on the AGHS ” title=”website” target=”_blank”>website http://aghs.c>. All games are played on KGS, in the AGHS Tournament Room (under Tournaments), and observers are welcome. AGF ACCEPTING APPS FOR COLLEGE SCHOLARSHIPS: The American Go Foundation is now accepting applications for its College Scholarship, reports AGF board member Matthew Mallory. “The scholarship is intended to reward organizers who create new, or help existing, go programs in their school or community, playing strength is less important than community service,” Mallory says. Applicants must be at least in their junior year of high school; winners will receive $1,000 and will be announced at the US Go Congress. “Last year Lawrence Ku, a model youth organizer, received the scholarship,” Mallory adds. The deadline is May 15: Click here to learn more and download the application form. AGA Games Database shows how players are linked through opponents. For example, AGA Database creator Jonathan Bresler 14k is just four players from Feng Yun 9P: Bresler played Stephen Leslie 14k in 1994, Leslie played Eric Lui 7k in 1996 and Lui played Feng Yun in 2007. The search can be unlimited across all games in the database, limited by date, or limited to a particular tournament. WHY HOST A PRO WORKSHOP? The Portland Go Club hosted two pro workshops in the past year, one by Jennie Shen in the fall and one by Yi Lun Yang in the spring. 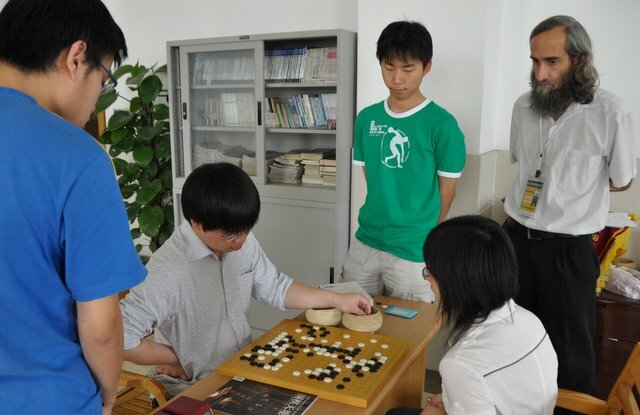 Both were attended by about 20 dan/low kyu players and middle/double kyu players. Jennie’s workshop was short on lectures and long on game review. Most of the weekend was spent with one group playing while the other group reviewed games, and then switching. Jennie’s tone was light and relaxed – she often cracked jokes, asking “You really played that move?” — teasing the players and making them feel at ease. Mr. Yang’s workshop was more balanced between lectures on various aspects of the game – opening, extensions, attacking, defending, life and death – and game review. Many of the kyu players took notes and Mr. Yang was serious and intense, expressing his strong passion for teaching. 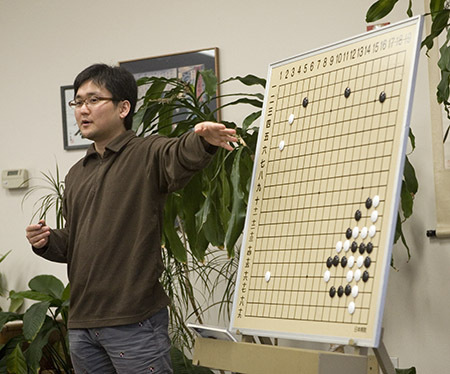 He also has a well-developed formal methodology for teaching go. As different as the flavor and structure of these workshops were, they were both excellent and well-received by the players. As a double-digit kyu player I had no idea about direction of play in the opening, let alone a systematic way to approach life and death problems. As a dan player, issues about crosscuts and opening strategy were clarified for me. I’d have either of them back in a Portland minute. Based on these two workshops I’d be equally happy bringing new pros in or bringing either of these two pros back. - Peter Freedman coordinates the Portland Go Club in Portland, Oregon, and co-directed the 2008 U.S. Go Congress.